The structural characterization of sulfated glycosaminoglycan (GAG) carbohydrates remains an important target for analytical chemists attributable to challenges introduced by the natural complexity of these mixtures and the defined need for molecular-level details to elucidate biological structure–function relationships. Tandem mass spectrometry has proven to be the most powerful technique for this purpose. Previously, electron detachment dissociation (EDD), in comparison to other methods of ion activation, has been shown to provide the largest number of useful cleavages for de novo sequencing of GAG oligosaccharides, but such experiments are restricted to Fourier transform ion cyclotron resonance mass spectrometers (FTICR-MS). Negative electron transfer dissociation (NETD) provides similar fragmentation results, and can be achieved on any mass spectrometry platform that is designed to accommodate ion–ion reactions. Here, we examine for the first time the effectiveness of NETD-Orbitrap mass spectrometry for the structural analysis of GAG oligosaccharides. Compounds ranging in size from tetrasaccharides to decasaccharides were dissociated by NETD, producing both glycosidic and cross-ring cleavages that enabled the location of sulfate modifications. The highly-sulfated, heparin-like synthetic GAG, ArixtraTM, was also successfully sequenced by NETD. In comparison to other efforts to sequence GAG chains without fully ionized sulfate constituents, the occurrence of sulfate loss peaks is minimized by judicious precursor ion selection. The results compare quite favorably to prior results with electron detachment dissociation (EDD). Significantly, the duty cycle of the NETD experiment is sufficiently short to make it an effective tool for on-line separations, presenting a straightforward path for selective, high-throughput analysis of GAG mixtures. Sulfated glycosaminoglycan (GAG) carbohydrates have presented a persistent challenge to the analytical community based on their enzymatically driven biosynthesis, which leads to high variability in the degree of polymerization, hexuronic acid stereochemistry, and location of the labile sulfate half-ester modification. The assignment of sulfate positions in a GAG chain is a significant need as this pattern determines the GAG–protein binding relationship and influences biological processes ranging from cell signaling, infection, and inflammation to metastasis and tumor growth [1, 2, 3, 4, 5]. Although the resultant highly heterogeneous GAG chain mixtures have historically defied efforts at full structural characterization, the advent of modern biological mass spectrometry, in particular soft ionization by electrospray (ESI) , coupled to advances in isolation, purification, and separation have led to an increasing understanding of GAG structure and functional relationships. The most recent discovery that the structures of GAG polysaccharides in the smallest proteoglycan, bikunin, are far from random, and in fact have a large degree of conservation in their sulfation pattern, demonstrates that sequencing intact GAG chains by mass spectrometry is a tractable analytical problem . Owing to the acidic nature of the sulfate and carboxyl groups that decorate GAG chains, they are readily ionized in negative mode MS by ESI. Accurate mass measurement of intact molecular species with high mass resolution yields a chemical composition, from which the degree of polymerization, the extent of O-sulfation of the chain, and N-acetylation or N-sulfation of the hexosamine units can be determined [8, 9]. 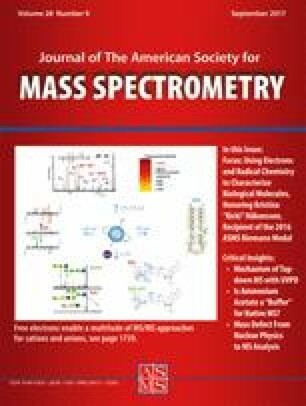 To define the exact sulfate location in the hexose ring of each monosaccharide constituent, a variety of tandem mass spectrometry approaches, including threshold  and electron-based [11, 12] methods in conjunction with statistical and computational approaches [13, 14, 15], have been applied. Fourier transform ion cyclotron resonance mass spectrometry (FTICR-MS) provides a powerful platform for GAG structural analysis because of its high mass accuracy and resolution in addition to the capability to perform a variety of ion activation approaches for tandem mass spectrometry (MS/MS) . Collisional, photo-initiated, and electron-based dissociation techniques have been utilized to successfully sequence GAG chains ranging from intact polysaccharides (dp27 to dp43)  to their depolymerized constituents typically varying from disaccharide (dp2) to decasaccharide (dp10) [10, 17, 18, 19, 20, 21]. Regardless of the activation method, the lability of the sulfate half ester modification remains a key analytical concern and appropriate precursor ion selection is mandated to avoid preliminary loss during ionization, ion manipulation, or during activation. If the sulfate remains protonated, a low-energy, facile rearrangement will result in loss of the SO3, leaving behind a hydroxyl or amino group, and eradicating any information about the location of this modification in the GAG chain. To obtain informative tandem mass spectra of highly sulfated GAGs during threshold activation such as CID, it has been recently demonstrated that either deprotonation or hydrogen/sodium ion exchange can significantly stabilize GAGs against sulfate decomposition [22, 23]. Failure to do so results in additional complexity to the spectrum and induces uncertainty in the assignment of the sulfate location, especially in de novo sequencing efforts . Similar approaches have been demonstrated in electron detachment dissociation (EDD) and have enabled sequencing of oligosaccharides shorter than dp10 [25, 26, 27], but EDD typically requires activation periods greater than 0.5 s  and the addition of excess sodium ions hampers fragmentation channels as the remaining acidic protons are hypothesized to participate in radical rearrangement reactions that lead to fragment ion production . The most desirable fragmentation approach is one in which bond dissociation is performed via nonergodic, low energy channels that would lessen the strict requirement to fully ionize all sulfate groups while requiring a short duration that would enable coupling to front end separations. The technique that satisfies these two requirements for anion tandem mass spectrometry is negative electron transfer dissociation (NETD) [29, 30], the negative-ion complement of electron transfer dissociation (ETD) . While ETD is most useful for biomolecules that readily form polycations, such as peptides and proteins, NETD was developed for polyanionic species. Tandem MS analysis of GAGs by NETD was first demonstrated using an ion trap mass spectrometer, but the modest resolving power of this instrument limited the ability to identify high charge states, or to make mass measurements of sufficient accuracy to identify products . NETD of GAGs was later demonstrated on an FT-ICR with ion–ion reaction capabilities , but initial reaction times ranging from 0.5 to 1 s were no better in increasing experimental throughput than EDD  In the presented work, we examine the suitability of NETD on a quadrupole linear ion trap-Orbitrap hybrid mass spectrometer to sequence biologically relevant GAG chains on a time scale amenable to capillary-based separation. Orbitrap NETD has been utilized to examine the acidic proteome [33, 34, 35, 36], but no published reports of GAG analysis by Orbitrap NETD exist. Orbitrap systems have become the most prevalent FTMS platform in biological mass spectrometry and are capable of reagent ion accumulation and ion–ion reaction times on a scale of tens of milliseconds, especially at higher precursor ion charge states . This increase in MS/MS duty cycle by roughly an order of magnitude compared with previous GAG NETD studies coupled to the mass resolving power provided by Orbitrap FTMS presents a direct path towards a GAG sequencing approach on widely available MS instrumentation. Well characterized GAG standards were obtained from chemosynthesis or enzymatic depolymerization as detailed below with chemical structures for each compound included as figure insets found in Results and Discussion. Heparan sulfate tetrasaccharide and hexasaccharide standards were prepared by chemical synthesis using a modular approach  and further purified by silica gel column chromatography. Synthetic product structures were confirmed by 1H nuclear magnetic resonance (NMR) and accurate mass measurement by FT-ICR MS. The pharmaceutical ArixtraTM was received as a gift. Chondroitin sulfate A (CS-A) oligosaccharides were prepared by partial enzymatic depolymerization of bovine trachea chondroitin sulfate (Celsus Laboratories, Cincinnati, OH, USA). A detailed protocol can be found in prior reports . Briefly, the intact oligosaccharide mixture was depolymerized with chondroitin ABC lyase from Proteus vulgaris, EC4.2.2.4. (Associates of Cape Cod, E. Falmouth, MA, USA) and reaction progress monitored by UV absorbance at 232 nm. The oligosaccharide mixture was further fractionated by gel-permeation chromatography (GPC), desalted, and lyophilized. Additional fractionation was performed by strong anion exchange, SAX-HPLC. The resulting fractions containing individual oligosaccharides were desalted and characterized by PAGE, ESI-MS, and high-field NMR spectroscopy. Mass spectrometry experiments were performed on a modified quadrupole linear ion trap-Orbitrap MS system (Orbitrap Elite, Thermo Scientific, Bremen, Germany) that has been described elsewhere [33, 34, 40]. Additional modifications were made to the instrument control software to enable NETD. Each analyte was directly infused at a concentration of 0.05–0.1 mg/mL and ionized by electrospray. Multiply deprotonated anions were observed for each sample presenting a range of charge states and Na/H exchange for tandem mass spectrometry experiments. Precursor anions were mass selected in the Velos Pro dual linear ion trap and reacted with the radical cation of fluoranthene for 10–100 ms with 24–36 Orbitrap scans acquired at a specified resolution of 120 k and averaged to obtain a tandem mass spectrum for each sample. External calibration of mass spectra resulted in a mass accuracy of 10 ppm or better. Peaks were selected with at least S/N 3. Data analysis was performed manually and in a semi-automated manner with Glycoworkbench  or in-lab developed software. Fragment ions are assigned based on the Domon-Costello nomenclature  with graphical depictions based on an extension of this approach developed by Wolff-Amster . Previous work in our laboratory demonstrated the first applications of NETD to sequence GAG oligosaccharides. Initial efforts were performed on a quadrupole ion trap mass spectrometer, which had the advantage of facile simultaneous trapping of positive and negative ions. This platform was capable of sequencing tetrasaccharides presented as doubly charged anions , but the resolving power was insufficient for the examination of longer, more highly sulfated and higher charge states. Since the latter are of greater biological relevance, we next attempted NETD on a FT-ICR mass spectrometer . This subsequent work demonstrated a capability to analyze longer GAG chains and more complex MS/MS spectra , yet the duty cycle and the ion–ion reaction times (500–1000 ms per scan) for NETD in the prototype instrument precluded the direct coupling to on-line separation methods. In our current efforts, we have ported our NETD sequencing approach to a hybrid Orbitrap FTMS system that provides an efficient platform for ion–ion reactions with times below 100 ms, which is much more amenable to front-end separations. Prior work in GAG MS/MS has also demonstrated the necessity of judicious precursor selection to retain the labile sulfate half-ester modification . After accurate mass measurement, it is trivial to assign the number of sulfate groups on a given precursor. Failure to choose an ion that presents all sulfates in a deprotonated state will lead to loss of the sulfate as SO3 during threshold ion activation, with methods such as CID or IRMPD. Owing to charge repulsion, it is unfavorable for all of the sulfate groups to carry a formal charge. The replacement of ionizable protons by sodium ions stabilizes sulfo-modifications, particularly as their density in a GAG chain increases. The investigation of appropriate precursor ion selection in the electron-based ion activation of GAGs is still ongoing. We have previously introduced the concept of an “ionized sulfate criteria (ISC)”  to determine the minimum ionized condition in GAGs that minimizes sulfate loss during dissociation where the total number of ionized sites (by deprotonation or sodium adduction) should equal or exceed the sulfate number. For chondroitin sulfate GAGs, it was determined that and ISC of 1 was optimal . A systematic study of the appropriate ISC in heparin/heparan sulfate GAGs has yet to be conducted. Here we have selected precursors with an ISC of 0 or higher for fragmentation studies. Although NETD induces fragmentation via radical pathways, sulfate loss is still observed, even when the optimal precursor is selected. Upon examination of the tandem mass spectrum for each analyte, multiple electron transfer events can be assigned, as well as a competing pathway, proton transfer. This gas-phase protonation in turn leads to a facile path for sulfate loss upon mild ion activation, which can occur in the high pressure regions of the dual linear ion trap during the NETD ion–ion reaction. Here we have structurally characterized highly sulfated chains that contain on average at least two sulfate groups per disaccharide, which represent a more realistic target for sequencing domains involved in protein binding, and obtained fragmentation consistent with prior NETD results while decreasing the reaction time ~ 10-fold. The MS/MS spectrum shown in Figure 1 results from the NETD of the [M – 4H]4- precursor ion of the synthetic heparan sulfate (HS) tetrasulfated tetrasaccharide, IdoA-GlcNS6S-IdoA-GlcNS6S-(CH2)5NH2 with an ion–ion reaction time of 40 ms. This species corresponds to the deprotonation of four of the six acidic residues on the tetramer. Based on the lower pKa of the sulfate moiety, it could be assumed that the two carboxyl groups are protonated, but based on prior experimental observations that protons can become mobile in gas-phase GAG ions , the possibility of a protonated sulfate cannot be precluded. As noted previously, two electron transfer events are assigned leading to stable odd-electron [M – 4H]3-• and [M – 4H]2-•• ions. Additionally, one proton transfer event is also observed, forming [M – 3H]3-. Depicted in the Figure 1 inset, glycosidic bond cleavages are assigned between all monosaccharide residues with the corresponding B/Y and C/Z ions assigned for each. A single sulfate decomposition (indicated by an open circle) is observed for all fragments except for Y2. No sulfate groups are present on the non-reducing end (NRE) iduronic acid. The presence of the complete set of glycosidic bond fragments locates two sulfo-modifications on each glucosamine ring. By accurate mass measurement of the precursor alone, it can be determined that both glucosamine residues are N-sulfo modified by the difference in sulfo (79.9568 Da) versus acetyl (43.0184 Da). These assignments are further confirmed by the presence of the 1,5A cross-ring cleavages on each hexosamine. The location of the 6-O-sulfation on each ring can be assigned by the mass difference between the 3,5An fragment and preceding B(n-1) or Y(n-1) bond cleavage. Although rare, it is possible that the 3-O position of glucosamine residues may be sulfated, and the generation and observation of cross-ring cleavages (as demonstrated here) is required to differentiate 6-O versus 3-O sulfation when all O-sites on a hexose are not fully occupied by a sulfo group. The synthetic heparan sulfate hexasaccharide, Compound 2, is longer than the previously sequenced tetramer by one disaccharide repeat unit, and increases the total number of sulfate groups to six. Although this molecule differs in the hexuronic acid stereochemistry compared with Compound 1, epimeric variations were not investigated, and recent work has uncovered methods to distinguish some of these epimeric residues [13, 45]. The selected precursor for the presented spectrum in Figure 2 corresponds to six ionized sites (five deprotonated and one sodium counter-ion) and was reacted for 25 ms. Similar to Compound 1, both electron and proton transfer events are assigned in the mass spectrum with charge-reduced ions detected for [M – 6H + 1Na]4-• and [M – 6H + 1Na]3-•• and the protonated [M – 5H + 1Na]4-. Glycosidic bond cleavages are assigned for all possibilities as both non- and sodiated ions, except for B1 which is not detected. As described for Compound 1, through a combination of accurate mass and glycosidic bond cleavage, two sulfate groups can be assigned to each amino sugar with one at the N- position on each residue. Variation is observed in the assigned cross-ring cleavages on the amino sugars, and the assignments utilized to deduce the site of O-sulfation vary slightly along the chain. For the NRE glucosamine, the difference between the 1,5X4 and 2,4X4 cleavages supports the existence of 6-O sulfation. The central and reducing end sites are both elucidated as 6-O sulfates by the assignment of 3,5A cleavages and the corresponding B or C glycosidic cleavage that occurs to towards the NRE terminus. Although the two previously discussed synthetic compounds correspond to chain lengths and sulfation levels that could occur in GAG–protein interaction domains and present realistic targets for method development, they contained a uniform disaccharide repeat leading to a homogeneous structure. We also examined the pharmaceutical product Arixtra to establish the suitability of Orbitrap NETD to sequence biologically relevant GAG oligomers with increased variability in sulfation pattern. With 10 ionizable acidic sites (eight sulfate/two carboxyl) along the pentasaccharide, a variety of Arixtra precursor ions based on the combination of deprotonated and sodiated sites are generated. These data examine a series of increasingly sodiated, pentuply deprotonated ions, [M – 8H + 3Na]5–, [M – 9H + 4Na]5-, and [M – 10H + 5Na]5–. Other recent work has examined the ability of NETD to sequence the [M – 4H]4–, [M – 5H]5–, and [M – 6H]6– charge states in Arixtra . Previously, we have examined an Arixtra series with eight to ten deprotonations by CID. At an ionized state of eight, only sulfate loss peaks were observed and no informative glycosidic or cross-ring were detected. It was only the fully deprotonated species of Arixtra (through a combination of ionization and sodium–proton exchange) that provided enough fragmentation to allow sequencing by collisional dissociation. In contrast, NETD is more tolerant of remaining ionizable protons. For the tandem mass spectrum in Figure 3, the triply sodiated precursor ion, [M – 8H + 3Na]5– was reacted for 20 ms. Additional charge states were examined ranging from five to three minus with reaction times ranging from 15–20 ms to 50 ms, respectively. To maximize the duty cycle, the [M – 5H]5– series was selected in the present work. Consistent with the prior heparan sulfate compounds, two electron transfer events are assigned at [M –8H + 3Na]4•– and [M – 8H + 3Na]3••–, as well as a single proton transfer leading to [M – 7H + 3Na]4–. Glycosidic and cross-ring cleavages are assigned along the entirety of the GAG chain and enable the full characterization of all sulfate sites in a single MS/MS event. As the fragment length is increased, the number of possible sodium counter-ions (numerically annotated in the inset) is observed to increase and directly correlates to the number of sulfate groups available for ion-pairing. Sulfate losses are mainly assigned on glycosidic bond cleavages. These assignments are typically more intense than the cross-ring cleavages and the corresponding cross-ring sulfate loss peaks may be below the limit of detection. By accurate mass measurement of the precursor ion, it can be confirmed that eight sulfate groups are present on the pentasaccharide with three at the N-sulfo position. The remainder are O-sulfo sites and can be assigned as either 6-O or 3-O on the amino sugars and 2-O on the acidic sugars. Starting from the NRE terminus, the first amino sugar is N-sulfo modified by accurate mass measurement of the following B1 or C1 glycosidic cleavage and 6-O sulfated by the difference in mass of the 2,4X4 and 1,5X4 cleavages. The second residue can be determined as unsulfated by the monosaccharide mass deduced in the difference of the neighboring glycosidic bond cleavages. Owing to the limited possible sites for O-sulfation on the amino sugar, glycosidic bond assignments, we conclude that this residue is fully occupied and definitively locate the presence of 3-O and 6-O sulfation in addition to the N-sulfo group known from the precursor mass. These assignments are further validated by the difference in Y3/Z3 and 2,4A3, which locates the 3-O site and difference in 1,5X2 and Y3/Z3. The 3-O-sulfation site is typically not observed but its presence in this sulfation pattern known to bind to Antithrombin III  and our ability to assign this site demonstrates the necessity of both accurate mass and a sufficient combination of glycosidic and cross-ring cleavages to confidently assign sulfate positions during GAG sequencing efforts. The adjacent hexuronic acid towards the reducing end contains one sulfate group by the increase in mass when the difference between the glycosidic bond cleavages on each side is measured. Similar to the unique assignment of 3-O sulfation on amino sugars , the only known O-sulfation site on acidic sugars is 2-O and is found on the iduronic acid epimers, whereas the glucuronic acid isomer is not known to be sulfated . Therefore, the determination of 2-O sulfation can be employed to infer the stereochemistry, which has a direct effect on the three-dimensional conformation of the GAG chain (and therefore protein binding), because the IdoA group can exist in either a chair or boat configuration whereas the GlcA ring is most stable in the chair configuration. The final O-sulfate group on the RE terminus is determined to be 6-O by the presence of 3,5A5 and B4/C4. Increasing the number of ionized sites on the precursor ion beyond the number of sulfate groups by using sodium counter ions directly affects the observed tandem mass spectrum and number of assigned product ions. These changes are depicted in Figures 4 and 5. Although the absolute charge state remains the same, increasing the number of sodium ions reduces the ability of a deprotonated site to move through a mobile proton to a nearby sulfate or carboxyl group. We have previously hypothesized that the absence of mobile protons shunts radical rearrangement reactions that lead to fragment ion generation in gas-phase dermatan sulfate GAG ions , and this is the first observation of a similar effect in the electron-based activation of heparin GAG ions. In Figure 4, only one protonated site remains on the precursor ion. The number of assigned cleavages is reduced from 32 to 17 compared with the triply sodiated precursor. The number of detected sulfate loss peaks is also reduced with only five glycosidic bond cleavages accompanied by these assignments. This result is a direct consequence of the decrease in remaining protons from two to one, further reducing the possibility for SO3 loss by the well-known facile hydrogen rearrangement in sulfate half-esters. With the reduction in assigned fragment ions, a combination of cleavage and inference based on known biology is required to identify the O-sulfation sites. As previously described, the N-sulfo sites are determined readily by precursor mass. The ability to identify the 6-O sulfation on both of the termini amino sugars is retained. For the NRE, the difference between 1,5X4 and 2,4X4, and for the RE, the difference between 2,4A5 and 1,5A5, definitively assign the sulfation site. The remaining sites of 6-, 3-, and 2-O sulfation can only be determined by the population of all available sites by a sulfate. Figure 5 depicts the NETD of Arixtra with all acidic sites ionized as [M – 10H + 5Na]5–. Sulfate loss has been further reduced compared with the two previous Arixtra spectra and only occurs due to proton transfer that leads to [M – 9H + 5Na]4–. Without this gas-phase protonation event, no sulfate decomposition should be observed. Similar fragmentation is observed compared with the previous NETD spectrum shown in Figure 4 with 17 assigned cleavages. The distributions vary between the two precursor ions, but NETD still generates informative glycosidic and cross-ring cleavages to determine the locations of all O-sulfo modifications. As previously described, the N-sulfo positions are determined by accurate mass measurement of the precursor ion in addition to the unique mass of each N-sulfated hexosamine. 6-O sulfation can be determined by the mass difference in 1,5X4 and 2,4X4 on the NRE glucosamine, and on the RE glucosamine by the mass difference in 1,5A5 and 2,4A5. 2-O sulfation can be determined on the iduronic acid residue by the occurrence of 0,2X1 and the central glucosamine is fully sulfated by occupation of all O sites on the hexose. Prior work has demonstrated the utility of NETD to sequence a moderately sulfated (one per disaccharide) dermatan sulfate octamer . Here we have extended this prior art to a chondroitin sulfate decamer presented in Figure 6. NETD sequencing of the [M – 5H]5– precursor ion results in a rich mass spectrum, the interpretation of which benefits from the high resolving power provided by FTMS. The initial characterization of the epimeric octasaccharide required 100 scans with reaction times approaching 1 s. We obtained data of similar quality in 36 scans with reaction times reduced to 35 ms. Accurate mass measurement of the precursor ion indicates the presence of five sulfate groups, all of which are located at O-sites. The acquired spectrum contains glycosidic bond cleavages between all monosaccharide residues and enables the location of a single sulfate to each N-acetyl-galactosamine. Although cross-ring cleavages are assigned on each residue, none is sufficient to confirm the existence of 4-O versus 6-O sulfation. This deficiency is consistent with prior results in the NETD and electron detachment dissociation (EDD) of chondroitin/dermatan sulfate as removal of an electron from the carboxylate is more energetically favorable . EDD has been applied to most sulfated GAG glycoform classes, including chondroitin/dermatan sulfates, heparan sulfate, and heparin ranging from tetramers to decamers [11, 25, 27, 39, 48]. EDD consists of two simultaneous/coupled pathways that result in fragment ion production. One is the electron detachment path, leads to radical site-based rearrangement mechanisms that produce both odd- and even-electron fragment ions and is shared by NETD. The other is an electronic excitation pathway that results in mostly even-electron fragment ions and is not accessed by NETD. We have previously employed this similarity between EDD and NETD to mechanistically examine the epimeric differentiation of chondroitin sulfate A and B (also denoted as dermatan sulfate) . The low propensity for sulfate decomposition by NETD compared with EDD enables a broader range of ionized states for precursor ion selection. It should be noted that the minimum ISC of 0 has been selected for this initial comparison of NETD and EDD. Only in the EDD of DS  has it been systematically determined that an ISC of 1 is optimal. Neither the determination of the appropriate ISC for the EDD of heparin/heparan sulfate nor the NETD of GAGs has yet to be conducted. Shown in Figure 7 are annotated structures comparing the NETD and EDD of identically ionized and sulfated heparan sulfate tetrasaccharides. Nearly identical fragment ions are assigned in each case with the notable reduction in sulfate loss during NETD depicted in the fragment ion distribution. EDD also requires electron irradiation pulse lengths of approximately 0.5 to 1 s, which makes it less useful for coupling with capillary separation, whereas the demonstrated NETD results in the current work ranged from 10 to 50 ms and would enable the collection of multiple scans over a separation peak. Regarding a comparison of NETD on various mass spectrometry platforms, there are only a few published examples of NETD of GAGs using FT-ICR with which to compare. From the limited data we have examined, NETD on both the Orbitrap and the FT-ICR produce many low intensity fragment ions that are analytically significant, specifically cross-ring cleavages than enable the identification of sulfation positions. In this respect, NETD behaves similarly to EDD. However, with the Orbitrap system, there is automated cutoff of low intensity signals, and the user cannot control or alter this setting during the processing of the data. This eliminates some important peaks, and also makes it difficult to make a direct comparison of the signal-to-noise levels for the two platforms. Mass spectrometry-based approaches for the gas-phase sequencing of sulfated glycosaminoglycans continue to progress, namely in the extended application of electron-based ion activation and informed precursor ion selection. The application of electron detachment dissociation (EDD) has resulted in an increase of structural information produced during a tandem mass spectrometry experiment, specifically the generation of cross-ring cleavages that enable the location of sulfate groups on each hexose. Although powerful, EDD conversion efficiencies are low and ion activation periods are typically on the order of 0.5–1.0 s per scan. To increase the experimental throughput of hyphenated separation-tandem mass spectrometry methodologies for GAG chain sequencing, ion activation must produce informative fragments in time durations that enable multiple spectra to be obtained during the elution time of a component. Collisional dissociation provides one means to attack this problem, but analyte ions produced with on-line separation do not always possess the appropriate degree of deprotonation to insure the retention of sulfate groups in the gas phase. We have demonstrated negative electron transfer dissociation (NETD) to be a more direct MS/MS solution for gas-phase sequencing that can be performed on a millisecond time scale, which can adequately sample a separation peak while at the same time be more tolerant of variations in sulfate group ionization states. NETD is observed to have most of the advantages of electron detachment dissociation efforts, particularly with respect to diminished sulfate loss, and NETD is readily coupled to the Orbitrap mass analyzer to provide the benefits of high resolution/accurate mass FTMS for GAG characterization. F.E.L. III and I.J.A. gratefully acknowledge generous financial support from the National Institutes of Health, grants R21HL136271 and P41GM103390. J.J.C. gratefully acknowledges support from NIH grants R35 GM118110 and R21 GM118341. N.M.R. was funded through an NIH Predoctoral to Postdoctoral Transition Award (F99 CA212454).